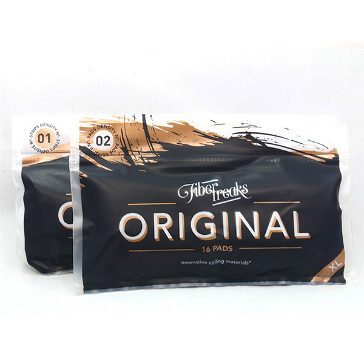 The Fiber Freaks Original range of wickpads is based on the first version of Fiber Freaks wicks. As in the first version, the raw material is reclaimed wood pulp (cellulose). They are made using an organic solvent and are synthesized under sterile conditions. These wicks are not whitened and contain no bleach. The improvement from the original wicks is in the physical structure - the fibers are longer and more parallel. This fiber arrangement delivers an even better performance compared purity and strength of the old version. Fiber Freaks Original No: 1 density wicks are extremely high performing in terms of absorbing and releasing liquid. Made with rigorously selected and processed wood cellulose with longer and more parallel fibers, the physical structure of No: 1 is not too dense; it is well-aerated. Although it provides exceptional wicking and flavor translation, No: 1 is not recommended for setups that need to vaporize massive amounts of liquid in a short time (if you have such a requirement, please purchase the Original No: 2 with its denser fibers that hold more liquid per unit of wick area).